Hassle-Free Mailing Services and More! Sending mail to different addresses can be a big hassle because it takes too much time and effort. This is especially hard to do if you’re running a small business where you do most of the work yourself. 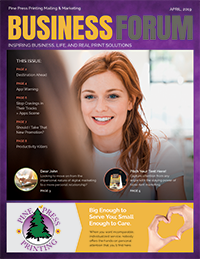 If this story is all too familiar, then Pine Press Printings mailing service is perfect for you! With Pine Press Printing, we can design, print and mail your brochures, letters, catalogs or postcards all under one roof. All you need to do is give us the list of people you want your mail to be sent to and we’ll do the rest! It’s that easy! Saving you money and time, we will do it for you! Our mailing list service, one of the mailing services we offer, is where we provide you with a list of people and their addresses according to demographics you specify. This is especially convenient if you are offering special promos and want to invite more customers to your store. It’s a very good way to reach a market you haven’t tapped yet. Because we barcode and sort the mail ourselves, postage rates are reduced greatly. At Pine Press Printing, we know mailing!